To visit the South of Ethiopia takes 10 to 15 days. Between Adis Abeba and Lake Turkana there are many interesting sights. The distances are long and the tracks sometimes hard. You can opt to see lots of things and cover lots of ground, or you can choose to take time to get to know people, travel more deeply into certain parts of your trip. Before reaching Arba Minch, you will pass through the Rift Valley, its lakes and its national parks. Afterwards you will discover the Konso area and its little villages perched on the hills, surrounded by cultivated terraces. 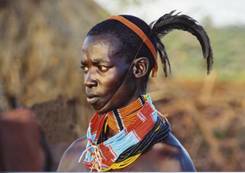 Then you will reach the Omo Valley and the Hamer, Dassanecht, Karo and Mursi tribes, with their ancestral way of life. The road back to Addis Abeba passes through the Borana area and the beautiful road to Yabello-Awasa. 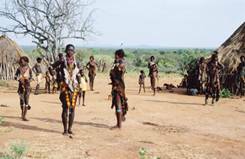 Will allow you to reach Turmi, a small village in the deep south, taking in the Rift Valley, Arba Minch and the Konso area. You will discover the Hamer villages, the customs of this exceptionally hospitable ethnic group, their housing and their costumes. The way back takes in Yabello and the Borana area. 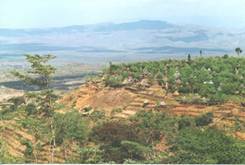 - A one-week tour will let you go as far as Arba Minch, via the high plateaus of the Dorze area. On the way, you will look down on the valleys of the big lakes, magnificent scenery! The Dorze people build beautiful huts, shaped like bullets, sometimes of amazing dimensions. You will come back to Addis Abeba via Jimma so as to take the charming Sodo-Jimma road and discover the Gourague area. Those trips can be combined with a North or West Tour.